The best nonstick cookware is easy to use, easy to clean, and the smooth slick coating prevents food from sticking to it. People are more health conscious today. They like using less oil, prefer olive oil, and porcelain nonstick cookware allows you to do this. Teflon® cookware is not used so much now in favor of porcelain or ceramic. Porcelain and ceramic cookware have no PTFE (polytetrafluoroethylene) used in Teflon® made by DuPont™. We are much more concerned with PFOA (perfluorooctanoate). The Environmental Protection Agency (EPA) has requested major chemical manufacturers to phase out this chemical a year ago in 2015. Nonstick cookware has no PFOA today. Perfluorooctanesulfoic acid (PFOS) is not used today either. When you let your nonstick pans get extremely hot, they can release other toxic chemicals—and the fumes kill birds. You never want these pots, pans, or skillets to heat up on the stove empty. They must always have a coating of oil or butter when frying anything. They must be used at medium or low heat and never at a high temperature. You cannot use metal utensils, but rather, wood, rubber, silicone, or nylon. These pans do not give you a brown crusty coating, nor do they sear as well as other products. They are typically made of aluminum for the base covered with ceramic or porcelain. This is less costly than copper or stainless steel. This cookware is ideal for frying breaded foods and will not break apart. Those less experienced cooks find these easier and quicker to cook a meal. One of the downsides is that some cannot be washed in the dishwasher. Some cannot go in the oven. T-fal® has been making celebrated cookware since 1954. 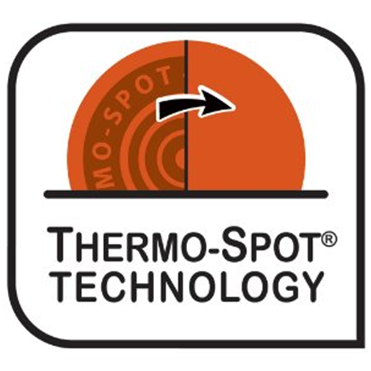 The orange Thermo-Spot® technology lets you know when to start cooking. The model E765SC will not warp with its TechnoResist base, is dishwasher safe, PFOA-free and is available in gray. The hard anodized aluminum base is extremely durable. The inside is a hard titanium nonstick surface for performance. The handles are made of silicone and remain cool attached with rivets for your comfort and safety. The set is safe to use in the oven to 400-degrees F. The set is lightweight and can be used on all stove tops except induction. The glass lids are vented with easy-to-grasp and hold handles. Your 12-piece set includes an 8- and 10.25-inch frypan, a 5.6-quart covered Dutch oven, a 1.1-quart, 2.3-quart, and 3.2-quart covered sauce and sauté pans. For the correct utensils to use, you will also receive a nylon slotted spatula and solid spoon for serving and preparing your food. This product is not PTOF-free. The set weighs 20 pounds. Gift-wrapping is available for a friend or loved one. You will receive a User’s Manual and a Lifetime Limited Warranty. The set is made in China. 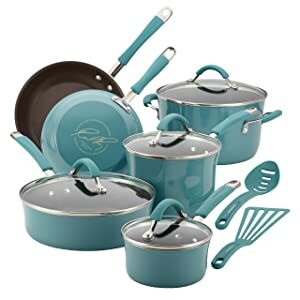 The Rachael Ray™ hard porcelain enamel cookware set is a lovely warm agave blue and also available in cranberry red, lavender, mushroom brown, and pumpkin orange. Any of these colors will coordinate with your kitchen décor. 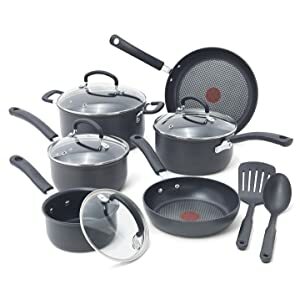 The set is nonstick, PFOA-free, and is black on the interior. The base construction is made of sturdy aluminum for fast even heat. The set is safe to use in the oven up to 400-degrees F. They are easy to hand wash and cannot be put in the dishwasher. Food gently slides off effortlessly with only a tad of butter or olive oil for cooking. The handles are rubberized with 2 rivets holding each one on with shatter-proof glass tempered lids for sealing in moisture. You can use them on glass, ceramic, gas, and electric stoves, but not induction. The set consists of a 1-quart covered saucepan, a 3-quart covered saucepan, 6-quart covered stockpot, 3-quart covered sauté pan, 8.5-inch open skillet, 10-inch open skillet, and a convenient proper nylon slotted spoon and spatula. The set weighs 17.5 pounds. Gift-wrapping is available for a friend or loved one. 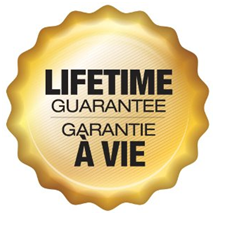 You will receive a User’s Manual and Lifetime Limited Warranty. The set is made in Thailand. The Italian company, Bialetti®, who says Italy is the heart of the home, created the Granito (granite) durable and easy to clean granite nonstick interior cookware for health and use of less oil or butter. It is PFOA-free made of ceramic enamel with the base of heavy-duty aluminum. The set is thick for uniform heating and cooking. It is recommended that the set be hand washed and not put in the dishwasher. The handles and lid grips are rubberized with a hole for hanging the pots. 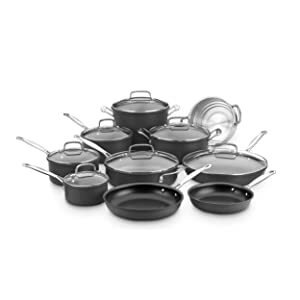 You can use metal utensils, the lids are tempered glass and the set includes an 8-inch fry pan, a 10.25-inch fry pan, an 11-inch covered deep sauté pan, a 2-quart covered sauce pan, a 2.5-quart covered saucepan, and a 5-quart Dutch oven. The set weighs 19 pounds. You will receive a User’s Manual and Lifetime Limited Warranty. The set is made in China. The Circulon® Symmetry cookware will not stick, and comes in black, red, and brown. The tulip shape rounded shape adds classiness to your kitchen. The anodized aluminum base is 2 times as hard as stainless steel. The set uses the TOTAL® Food Release System from Circulon® is PFOA-free and you can use metal utensils. 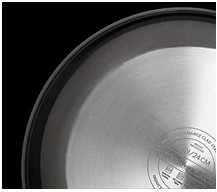 The 3-layer nonstick interior with raised circles reduce surface abrasion. No oils or butter are needed, the set will not chip or scratch, and you can mash foods right in the saucepans! They can be safely used in the oven to 400-degrees F.
The stainless steel bottoms can be used on all stoves including induction. The handles are comfortable made of cast stainless steel with a silicone coating for comfort and coolness. The tempered glass lids let you see what’s cooking without any loss of moisture or heat. They do not have vent holes and are trimmed in stainless steel. These pots and pans are dishwasher safe. 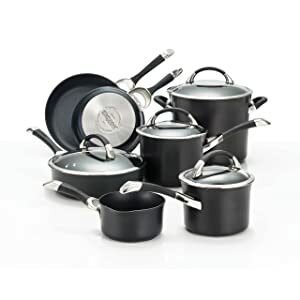 The set includes a 1-quart pouring saucepan, 2- and 3-quart covered saucepans, an 8-quart covered stockpot, with 8.5- and 10-inch skillets, with a 3-quart covered sauté pan. The set weighs 28 pounds. Gift wrapping is available for those you care about. The set comes with a User’s Manual and a Circulon® hassle-free Lifetime Guarantee. They are made in Asia and distributed by Meyer Commercialware, Inc. The Cuisinart® model number 66-17 is stylish and functional for great cooking encouraged by French chefs. Cuisinart® has been making the best kitchenware for over 30 years. The nonstick hard anodized aluminum core will give you unsurpassed cooking for special occasions and everyday meals. The hard exterior is much harder than stainless steel, is dense, nonporous, and durable for home use or professional chefs. The high quality Quantanium® nonstick interior with titanium strengthened surface provides you with health conscious cooking that are easy to clean and will use metal utensils safely. 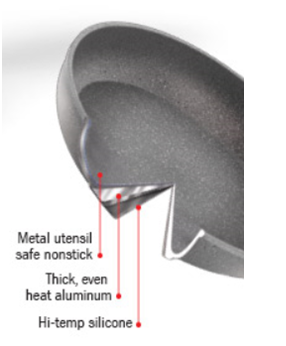 You will love the cast stainless steel Cool Grip™ stick handles that stay cool on the stove when cooking and provide you with a safe hold. The handles are riveted for stability. The rims of the cookware are tapered for easy pouring without a mess dripping down the sides. The stainless steel lids fit tightly. You can put these in the oven to 500-degrees F, on the stovetop, under the broiler, and safely freeze. These cannot be used on induction stoves or in the dishwasher. 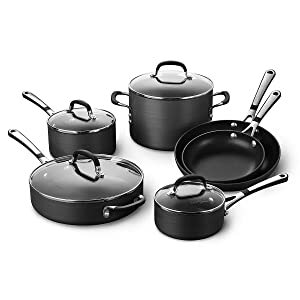 You will receive a 1.5-quart saucepan with cover, 2-quart saucepan with cover, 3-quart saucepan with cover, 4-quart sauté pan with helper handle on the front and cover, 9-quart stockpot with cover, 8-inch open skillet, 10-inch open skillet, 12-inch skillet with cover, a 7.87-inch multi-steamer insert with cover, and a 9.44-inch pasta insert. The set weighs 38 pounds. You will receive a User’s Manual and a Limited Lifetime Warranty. The set is made in China. 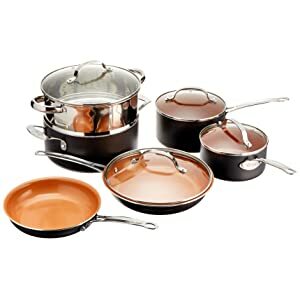 The Simply Calphalon® set has an interior coating nonstick surface that is double coated, tempered glass lids with silicone handles, and the construction is hard anodized aluminum to give you even heat conduction. They are safe to use in a 400-degree F. oven; however, they are not dishwasher safe. You can only use nylon, plastic, or wood cooking utensils. This set is compatible for gas, electric, electric rings, halogen, and glass top stoves, but not safe on induction units. Make your favorite caramel and other sticky recipes without a gumming problem with the beautiful black Calphalon® cookware. Your set will have an 8- and 10-inch omelet pan, 1.5-quart saucepan with cover, 2.5-quart saucepan with cover, a 3-quart sauté pan with cover and a 6-quart stockpot with cover. The set weighs 20 pounds. Gift-wrapping is available for friends and family. 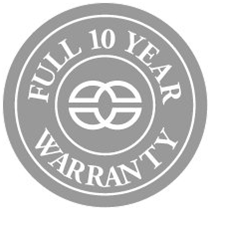 You will receive a User’s Manual and a full 10-year Warranty. The set is made in China. The Anolon® Advanced Bronze Collection is created with the finest thick heavy-gauge anodized aluminum. This provides you with even heat for the best results. The SureGrip handles are made of stainless steel with silicone coverings securely riveted for a safe soft grasp. 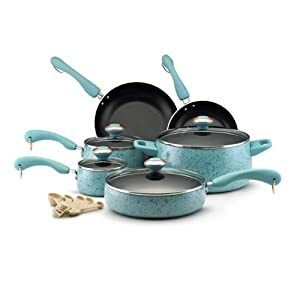 The set is safe to use in your oven to 400-degrees F. You will have nutritious and health conscious cooking with the PFOA-free DuPont® Teflon® interior Autograph™ 2 nonstick cookware. These have been tested in professional kitchens by reputable chefs. There are no hot spots eliminating scorching and food burning. The set is a tulip shape meaning they are rounded at the bottom. The lids are dome shaped and are made of tempered glass with stainless steel support rings around the edge for safe sitting on the cookware rims. The bronze color will harmonize with any kitchen décor and are beautiful. The box states you can use metal utensils, but if you don’t want scratches use wood, nylon, plastic, or silicone. The set contains a 1.5- and 3-quart covered saucepan, 8-quart covered stockpot, 8- and 10-inch French skillet, 12-inch shallow grill pan, and a 3-quart covered sauté pan. You will receive free bonus items of a 9.5-inch open skillet and a 3-quart covered sauté pan to use with a swing lid. A griddle is an open stock item on Amazon.com®. The set can be used on ceramic, gas, electric, and glass stove tops but not induction stoves. You must hand wash the set; they are not dishwasher safe. The set weighs 24 pounds. You will receive a User’s Manual and a Lifetime Warranty. The set is made in Thailand by Meyer Commercialware, Inc. 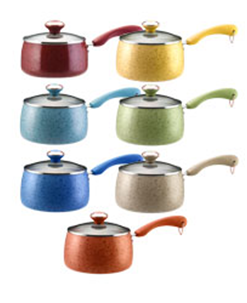 The KitchenAid® cookware model number KCAS08ER is constructed with anodized aluminum. (The model KCSS08ER has a stainless steel base.) Don’t want you to be confused—the aluminum product is discussed here. The available colors are Empire Red shown here, Polished Stainless Steel—KCSS08LS, and Onyx Black—KCSS08OB. The set is dishwasher safe and the outside is made of a nonstick colorfast finish. The nonstick interior surface is made of 3 layers. The bottoms of the set are made of stainless steel. You can use this set on all stove top surfaces including induction. The riveted handles are made of stainless steel and are cool to touch. The lids are tempered glass in a dome shape with handles for lifting off. 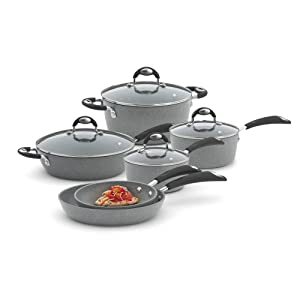 The set is oven safe to 375-degrees F.
The aluminum set includes a 1.5-quart saucepan, 8- and 10-inch skillets, 3-quart saucepan with lid, and an 8-quart stockpot with lid. The set weighs 10 pounds. Gift-wrap is available. You will receive a User’s Manual and a Lifetime Limited Warranty. The set is made in Thailand by Meyer Commercialware, Inc. The Paula Deen® nonstick porcelain set is exciting to look at with its speckles on the outside porcelain. Available colors are aqua speckle, blueberry, butter, coral, honey, lavender, oatmeal, pear, and red—all with speckles. 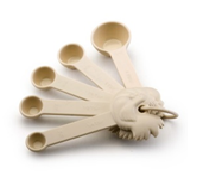 The 15 pieces include each 5 measuring spoon size as a “piece”. Hmmm. Only use wood, plastic, silicone, or rubber as utensils. Metal will scratch the surface inside. The color resists stains and maintains it color. The heavy-gauge base has no hot spots that can burn and scorch foods. 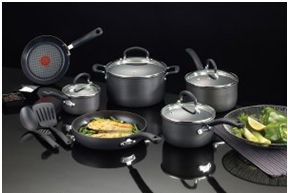 The nonstick interior is made of black DuPont® Teflon®. The lids are tempered glass with cool handles. The handles are riveted twice and are soft when handling them. The handles have copper-plated O-rings for hanging. They are safe in the oven to 350-degrees F. The instructions tell you not to put them in the dishwasher. They can be used on gas, electric, glass, but not induction stoves. Gift-wrapping is available for your friends. You will receive a User’s Manual and a Limited Lifetime Warranty. The set is made in China. The Gotham™ Steel set is made of high-grade titanium and ceramic as the interior surface. Everything slides off and you only need a tad of butter or olive oil. The pots and pans are lightweight, PFOA, PTFE, and PFOS-free for your healthy life. This set can be used on most stove tops—gas, electric, glass, except induction. It will sear and brown, and burned chocolate or cheese will slide right off. The coating inside will not peel or flake off. Acidic foods are not a problem and the set can be used in the oven. The set is dishwasher safe. You can use an electric mixer and the interior will not scratch. That must mean you can use metal utensils, but read your instruction book. The pans can go into the oven up to 500-degrees F. Be sure to use a pot holder on the handles because they are metal. Do not put the lids in the oven; they have a plastic ring around the handle knob and will melt. 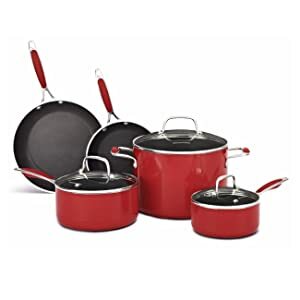 The set includes an 8.5- and 10.25-inch frying pan with 10.25-inch frying pan lid, 1.5-quart pot with lid, 2.5-quart pot with lid, and a 5-quart aluminum steamer insert and lid. The set weighs 12 pounds. Gift wrapping is available. You will receive a User’s Manual and a 90-day Money Back Guarantee, less postage and handling charges. The set is made in China. Nonstick cookware is easy to cook in and slides right out of the pan without sticking. 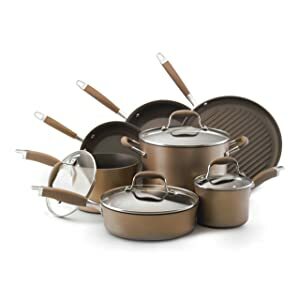 Nonstick cookware uses less fat than other cookware, such as stainless steel and cast iron. Warm water with a mild dish detergent is best for cleaning nonstick cookware. Manufacturers recommend not putting in the dishwasher because the extremely hot water and caustic detergents will ruin them; they are a breeze to clean by hand. For foods that have stuck on food, soak in dish detergent in warm water for an hour then rub off gently with a cloth or sponge. When foods are extra difficult to remove, never use scouring pads or harsh cleansers, brushes, or steel wool pads with soap because the finish will be ruined and corroded forever. When using each time, add a pad of butter, a little olive oil, or coconut oil to the pans. Never heat the pan before added the oils. Cooking sprays will make the nonstick cookware gummy and hard to get off. Usually made of aluminum, nonstick cookware heats faster than the thicker metals do, such as stainless steel, or cast iron. It’s best to use heating temperatures of low to medium. Never heat above medium due to toxin release and deterioration of the surface coating. Do not use metal devices in nonstick cookware; it will scratch then the surface will be marred and pull away from the base. You will also have it in your food. Never use sharp knives, mashers, whisks, or rotary beaters that will nick and scratch the interior coating. Always read the User’s Manual to see what the manufacturer says about putting the nonstick cookware into the oven. Some are safe in the oven and some are not. We hope you have an idea of what brand of nonstick cookware is best for you and your family and that the information given is useful and helpful. Always check for a Warranty of at least a year where the manufacturer offers excellent customer support. Happy shopping! I have read some reports of Gotham Steel pans and another brand Copper something. These were by folks who had bought and used the pans. Neither one was near as good as advertised, they started out OK, but quickly degraded to food sticking very badly on them. My point – since Gotham is very highly rated here, why would I think any of the pans in this test is any good? You might be thinking of Copper Chef for the other brand. I have owned and used nonstick ceramic and porcelain skillets for years now. I have no problems with them and they are 3-years-old. People usually don’t take care of them. You must put butter or a little oil in skillets to cook and fry. In the pans when water, juice, or a sauce is used for vegetables, no oil is needed, unless you want it. The liquid keeps the foods from sticking to the bottom. Gotham is a great product. Again, you must take care of the cookware and not use them the same as a cast iron black skillet! The porcelain or ceramic coating is more delicate, but I can tell you, when you don’t put them in the dishwasher, wash by hand in detergent, rinse, and towel dry, they function and look as good as the day you took them out of the box. The tests are genuine—it’s the users who create the problems I think. I can make food stick too if I try. I just let the skillet cool, wash by hand, and it’s ready to use again. I am a real person who evaluated nonstick cookware. Your friends or reader comments might not be using the cookware as instructed in the User’s Manual. Since real people bought and reviewed Gotham Steel pans and were quite disappointed, as they ended up quickly degrading to the point food stuck badly on them and they are highly rated here, why should I give any merit to these tests? For your second note here: Yes, real live people use the pots and pans including Gotham Steel products. Food will not stick when oil or butter is melted to coat the bottom of the ceramic porcelain before adding the food. As food cooks, more butter might need to be added. I am happy with mine and never put them in the dishwasher either. Why? Because dishwasher detergent is harsh and more powerful than detergent we hand-wash dishes, pots, pans, and skillets in with warm water in the sink. Some dishwasher soaps will put abrasions on glass to the point they look etched. I wish you luck with your new set and read the manufacturer’s instructions so they stay beautiful for many years. They are more delicate than plain stainless-steel products but clean up so much quickly with the wipe of a cloth or sponge to be shiny bright. Additionally, you cannot use metal utensils, knives, or sharp edges with ceramics. I love using wood spatulas and spoons with my set, and on another note, wood is soft to not smash foods! Let me know how this effects your decision to buy. If my Gotham pan can withstand a metal mixer, then why must I be concerned not to scratch the pan with metal utensils? I only use non-metal utensils on my Gotham pan because of the contradictory warnings. So far, so good. Did you read both sentences I wrote? Another thing, beaters for electric mixers usually have plastic nubbins on the bottom center of each beater so as not to scratch. Hope this helps clarify the “scratching” issues. I used my pot for mashed potatoes and my mixer took the coating off. Why is it that the mixer beaters took alittle bit off but it still did it? You must have used a Teflon® coated cooking pot. The beaters of the mixer are metal. 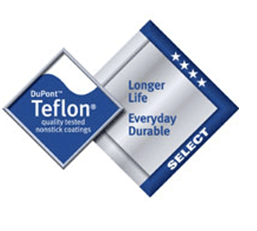 You cannot use metal in Teflon®! Cook your potatoes for mashing and pour them into a glass bowl or stainless-steel pot and you will not have the problem with non-stick cookware coating coming off. Only use wood, nylon, rubber, or silicone with Teflon® cookware or ceramic cookware. Hope this helps you understand better. AT @4, Circulon, it says, “The anodized aluminum base is 2 times as hard as stainless steel.” Does this mean it is harder than stainless steel? If so, could that mean it is brittle? There are several different hardness scales, which one was used? What is the hardness scale of stainless steel and what is the scale on all surfaces reviewed, using the same scale? While I am not a chemist or metallurgist, anodized aluminium can be 2-times as hard as stainless-steel. Hard does not mean “brittle.” I have no idea what was used or hardness scales. You can check that for yourself on the Internet or at the manufacturer. Stainless steel cookware is a nickel iron metallic compound. Hard anodized is aluminium cookware is treated to make it corrosion resistant and typically non-stick. Stainless-steel typically is harder and can last longer. Both types of pans work to a large extent the same. Some cooks will dispute this because aluminium is softer and cannot take the abuse that stainless-steel can take. For induction cook-tops you need a pan made of magnetic materials. Usually stainless-steel cookware is a low grade stainless so its magnetic and works on an induction cook top. Aluminium is not magnetic so hard anodized will not work with and induction cook-top without a steel insert in the bottom of the pan.